Fire is a simple substance. Harnessed by humankind, manipulated, reshaped and tasked with a complex array of purposes. From cooking our food, starting our cars and producing electricity, fire is an essential component to sustaining life as we know it. Whether we like it or not, humans have burned our way into the future through industrial advancement and energy consumption. 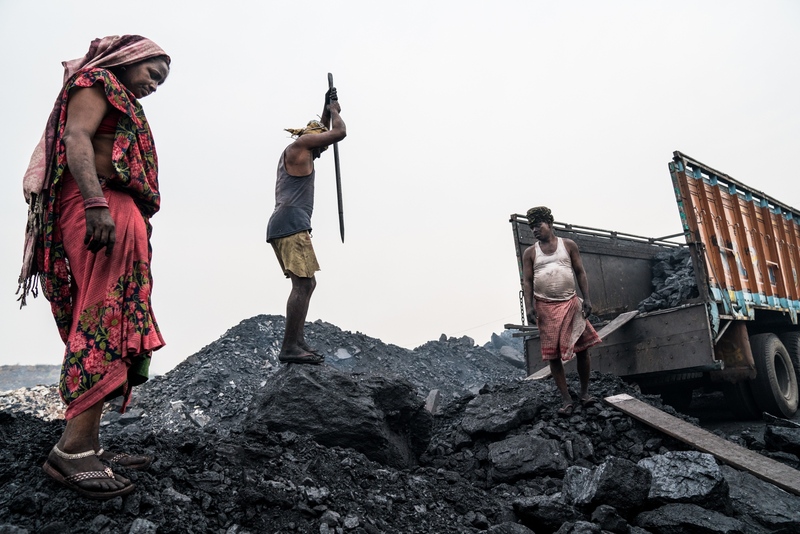 Yet an unintended by-product of this is a material known as black carbon, which is now doing untold damage across South Asia impacting majorly on world health and the environment. 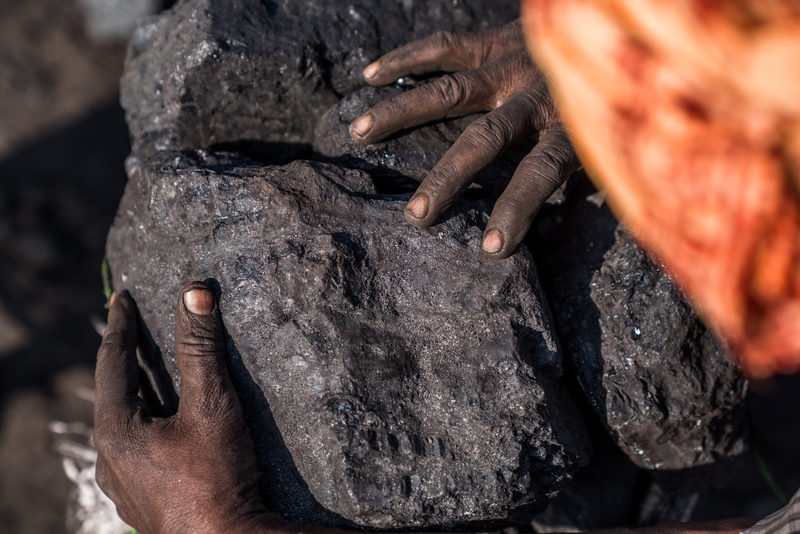 Commonly known as soot, black carbon is the particulate matter produced from the burning of materials, whether that be from a diesel engine, a coal power plant or in the case of many homes in South Asia, a fire fueled by animal dung. As Asia’s population grows, so too, does the impact of soot on our health and environment. 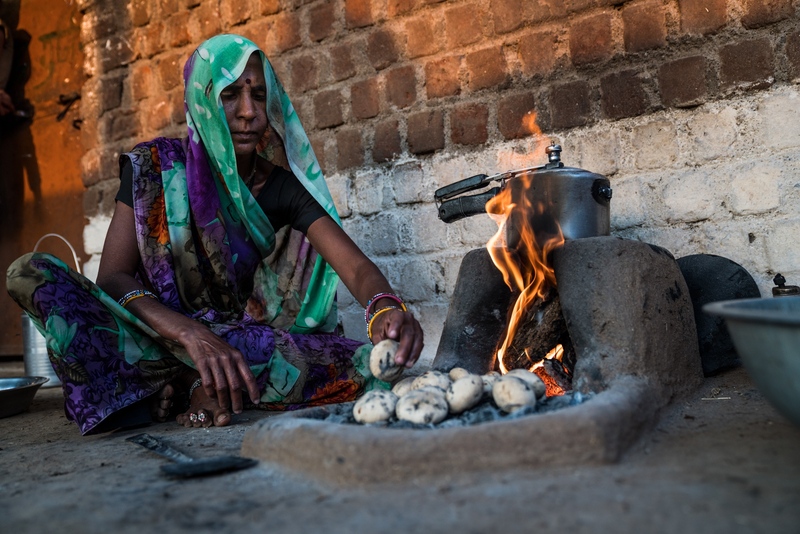 In India alone, over 500 million people still rely on solid fuels for basic household duties like cooking. When inhaled, black carbon is a major contributor to respiratory illnesses that mostly affect women and children. 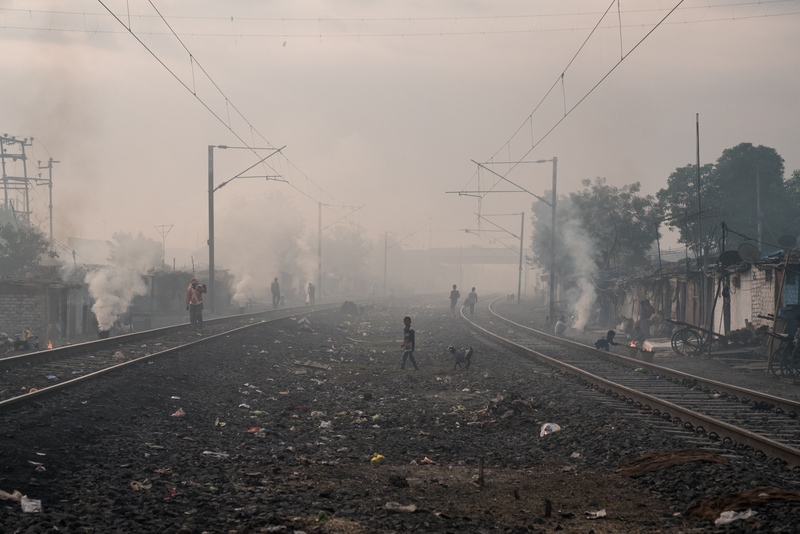 Over 100,000 children in India die annually due to smoke-related respiratory illnesses. On a global scale, the World Health Organization estimates that indoor and outdoor air pollution is responsible for 7 million deaths annually. When emitted into the atmosphere black carbon particles settle and absorb large amounts of heat from the Sun due to their dark colour. 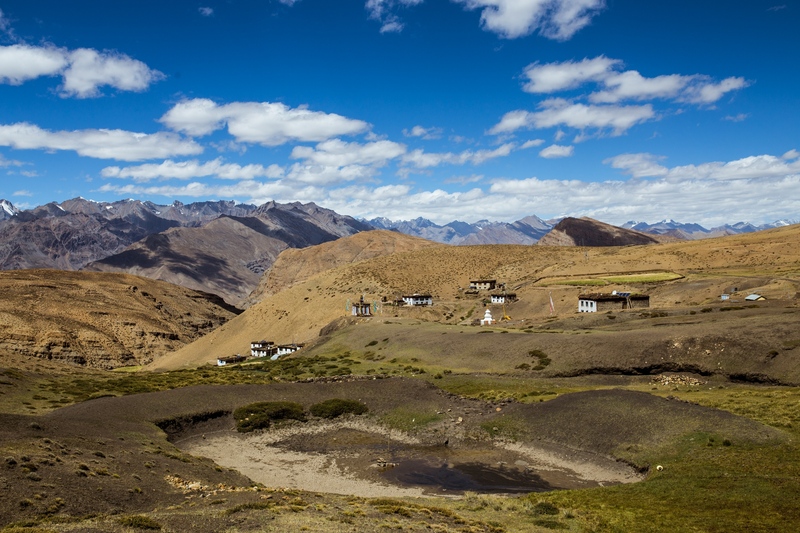 This has become prevalent in the Himalayas where black carbon has deposited in the glacial region, doubling the warming impact of climate change and in turn accelerating glacier retreat. These glaciers are a crucial water source for the region that provides water for 1.4 billion people. Without these vital glaciers, the entire Asian continent will begin to face serious water security issues. However, studies have shown that if black carbon emissions were to be controlled, global temperatures would be decreased by up to half of a degree, helping to marginally offset some of the impacts of climate change. As soot is not an overly long-lasting substance, in only a number of weeks and if we cease the burning of materials, black carbon can be naturally removed from the atmosphere and the places where it has settled. As a result, a small reduction in carbon emissions and a chance for world governments to develop strategies to deal with inevitable climate change. Many nations have demonstrated that soot can be dealt with using existing technology, efficient design, and better access to cleaner fuels. 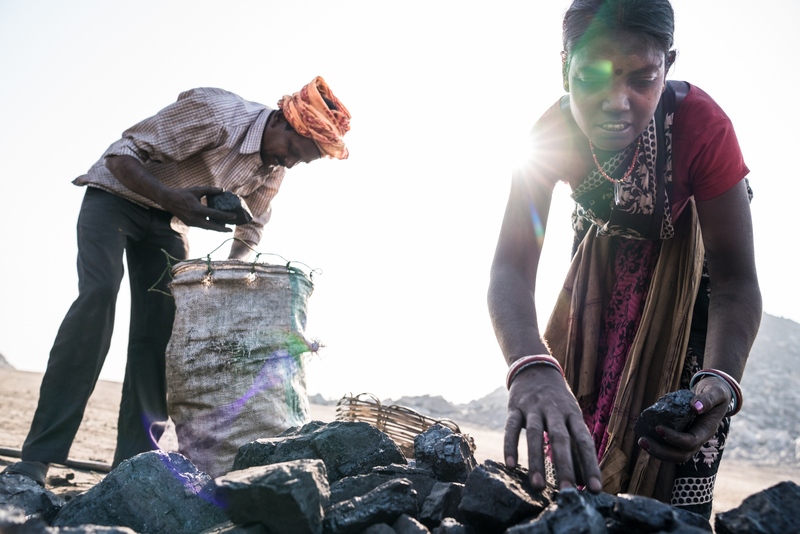 Yet due to the sheer scale of the problem in South Asia the management of black carbon remains a difficult task, but one which is critical in some cases to personal survival. The positive benefits arising from the elimination of soot and the positive impacts to both our health and the environment are well founded, but how much more damage will need to occur for us to take a hard look at ourselves and our dark materials. 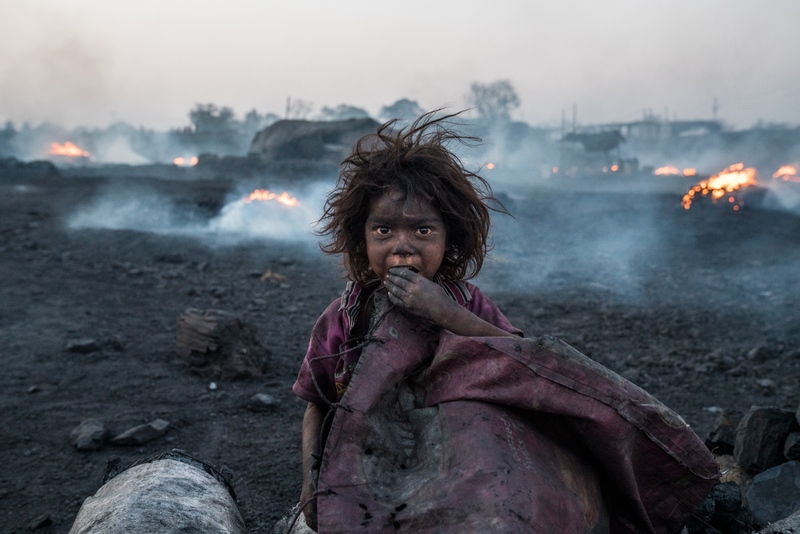 A child, covered in coal dust and breathing in deadly black carbon particles and gases, sits inside a black-market charcoal producing area nearby one of India's largest coal mining areas in the state of Jharkhand. Black carbon and its sources from coal-mines to household cooking fires burning coal, wood and dung. Fire and smoke are everywhere. 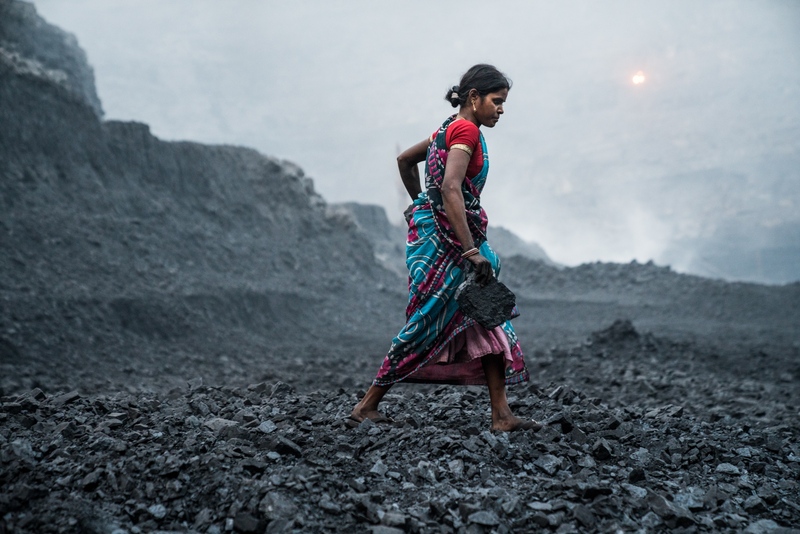 A female coal miner scavenges for coal deep inside a mine in one of India's largest coal mining regions in the state of Jharkhand. A coal miner making sure the blocks or coal are securely placed inside the stack before it is transported away for sale or personal use. 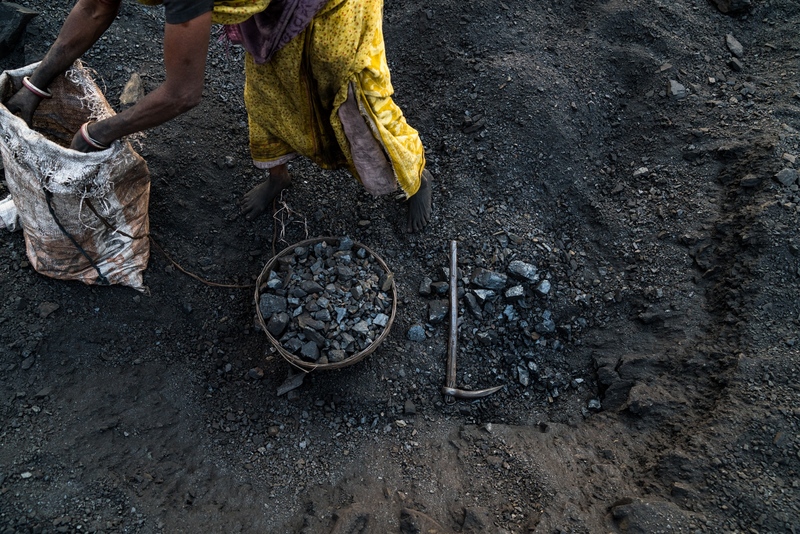 Miners select scavenged coal for sale or to be used personally in their homes as cooking fuel. 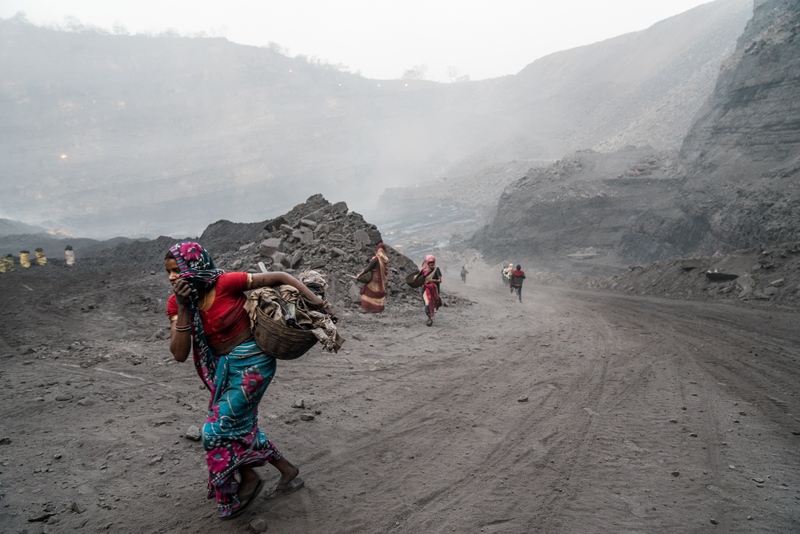 Coal mine scavengers, who are not legally allowed to be inside the mines, run for cover after hearing that police are on the way to check on scavenger activity. Once a village, it now lays in rubble due to underground fires that have destabilised the land below. Apart from destabilising the land, the fire releases a constant stream of black carbon and other dangerous gases and particulates. India. 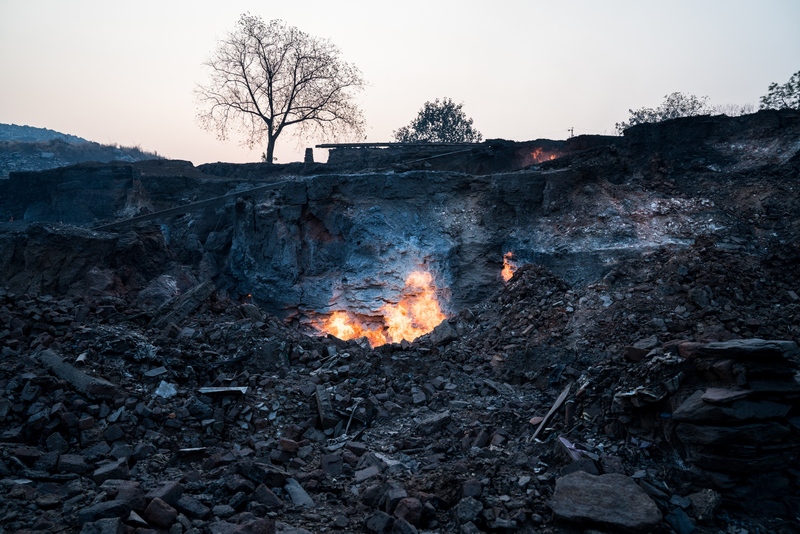 A decommissioned coal mine in Jharkhand, India, catches alight from an already burning underground fire releasing copious amounts of black carbon and gases. India. A basket full of coal amongst a coal miners tools. This coal will be transported to be sold or used personally as cooking fuel. India. 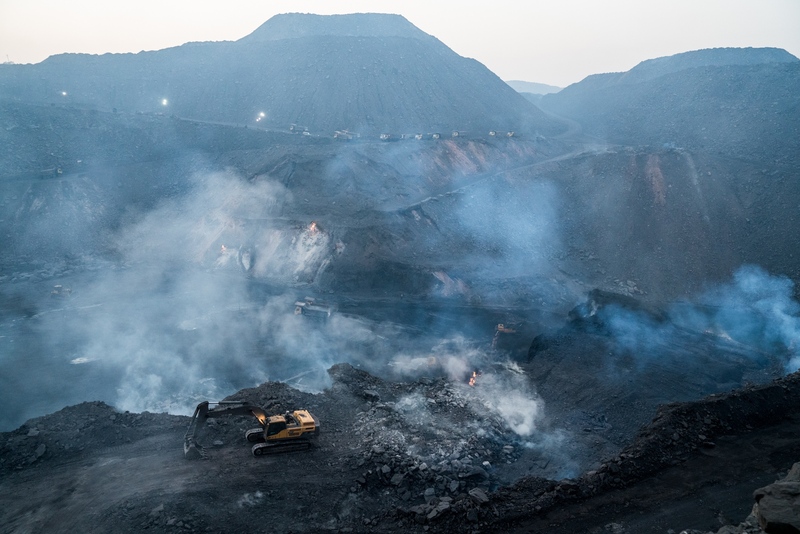 Miners break apart coal for large scale transport to use as fuel in power plants across India that spit out vast amounts of black carbon and other particulates for electricity production. 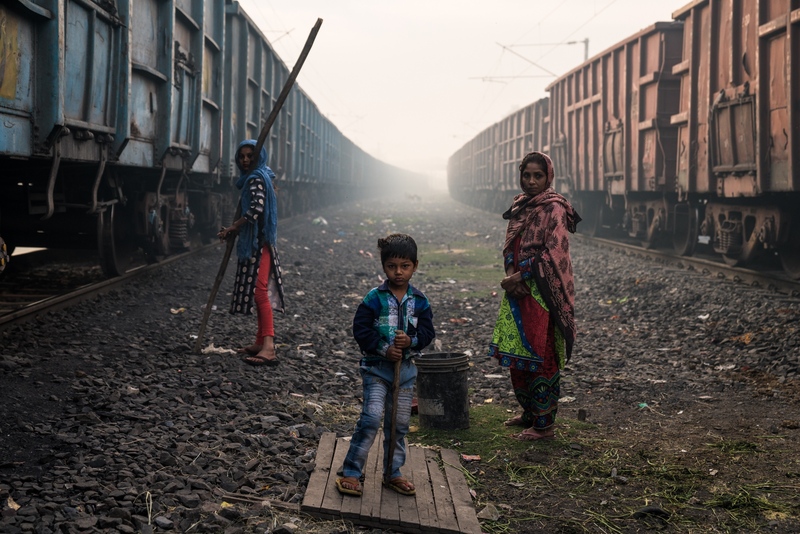 A mother and her two children wait for the trains to halt; after they will break into the carriage using the long stick to steal left-over coal for cooking fuel. Central India. 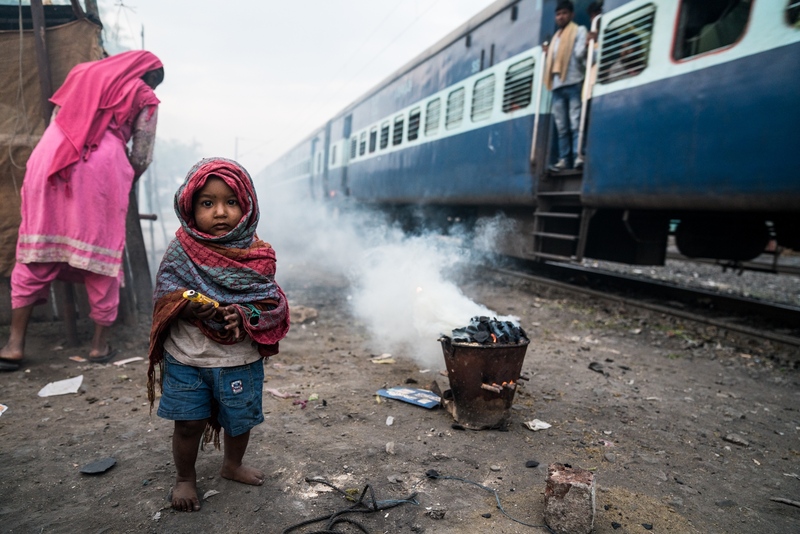 A child waits by a morning stove, called a chulla, that is burning coal and will be used to cook breakfast. India. 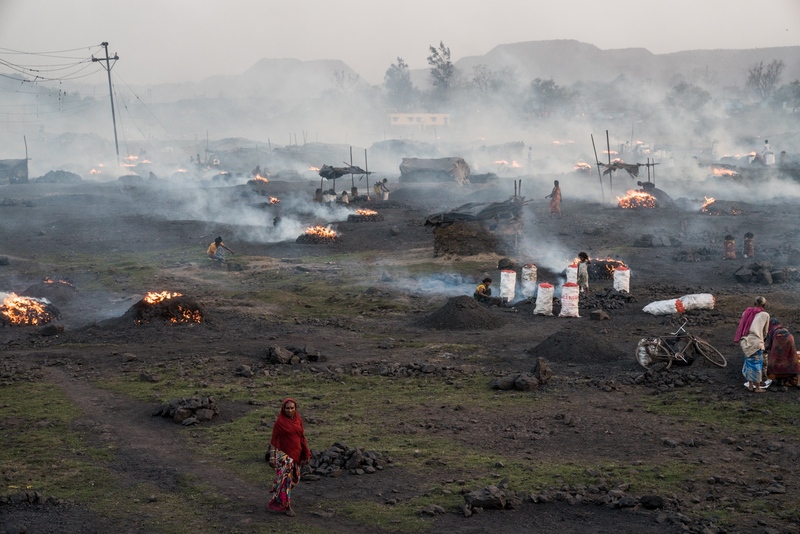 Miners off-load coal in a charcoal-producing area, which constantly blankets the region in thick smoke. India. A young girl stealing left-over coal from a coal-train carriage to use for cooking fuel. India. 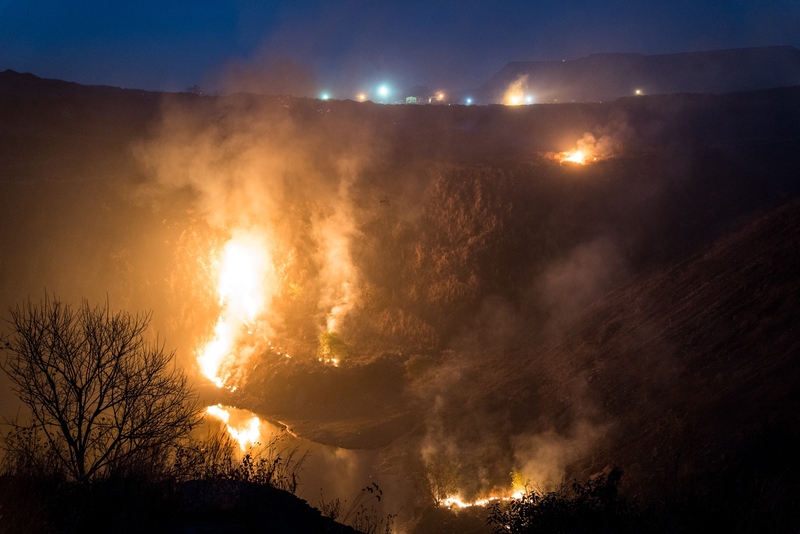 A charcoal producing area that is in operation every day and night contributing to the already dangerous levels of black carbon particulates and deadly gases. India. A woman with her baby prepares a fire before cooking dinner using a mixture of dung and wood as fuel. India. 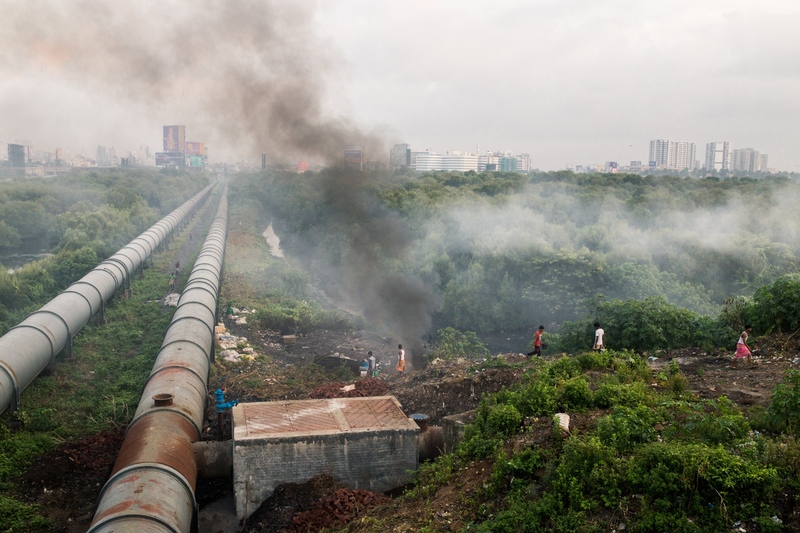 Smoke rising from a burning garbage dump releasing deadly chemicals from plastic and black carbon from organic material in India's metropolitan city of Mumbai. 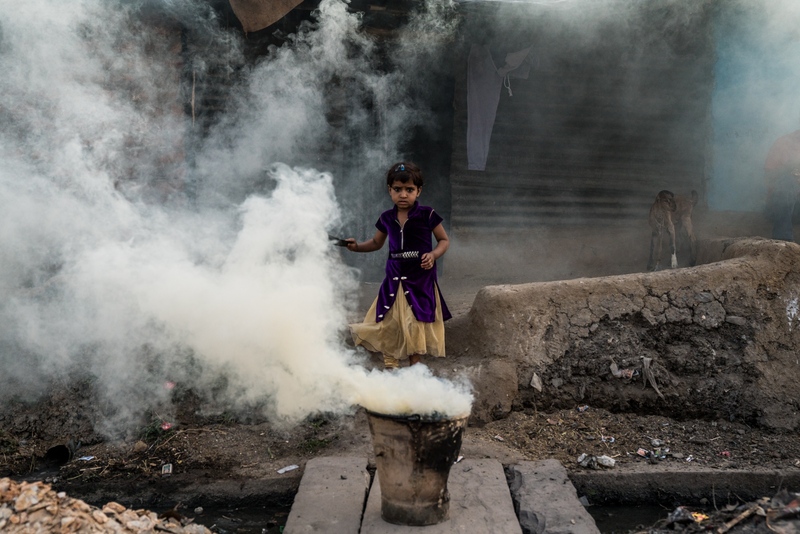 A girl emerges from the coal smoke of her family's chulla before dinner time. India. 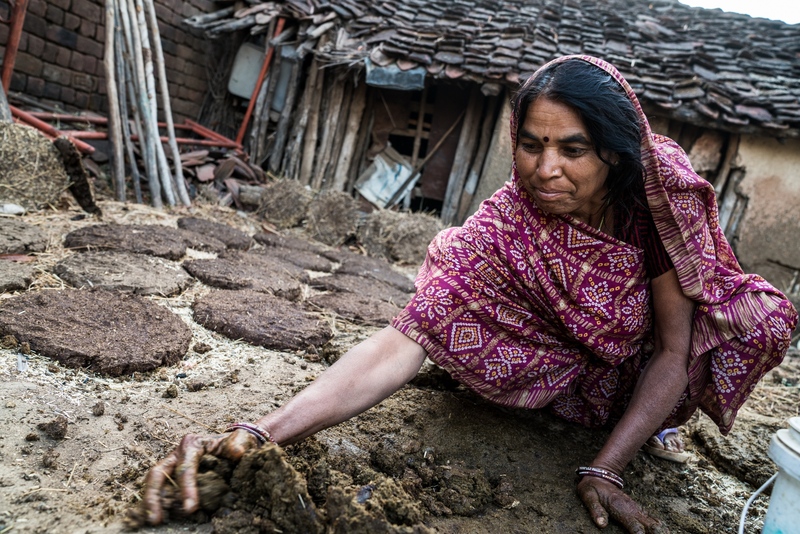 A woman putting together freshly collected dung to be made into dung patties, which will, in turn, be used for cooking fuel. 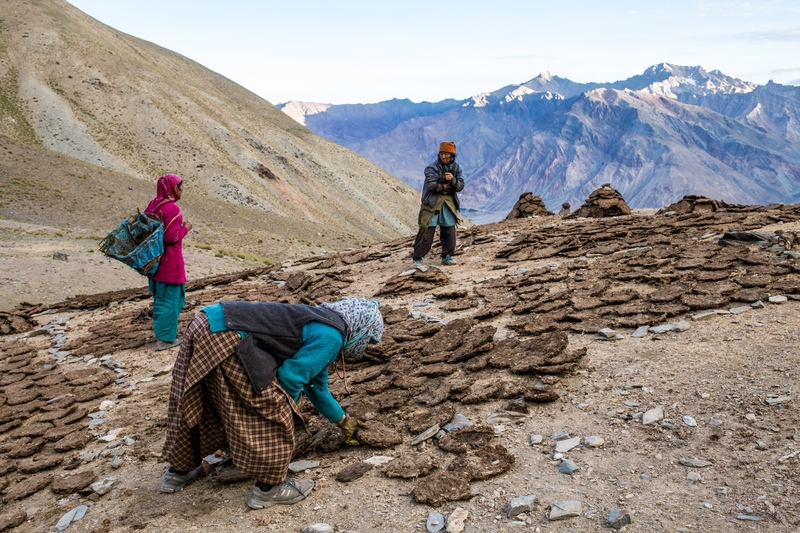 Women in the Zanskar Himalaya, India, organise dried dung cakes during the short summer months in preparation for winter, where they will use it for both cooking and heating fuel. 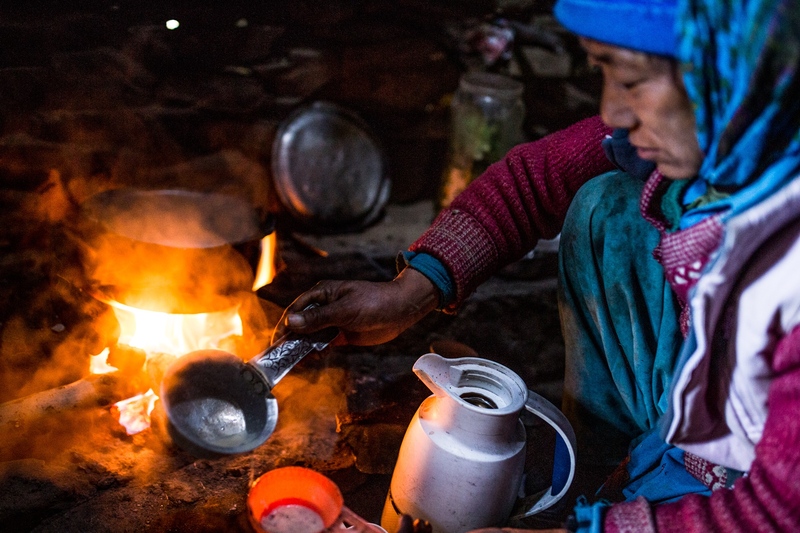 A dung-fuelled fire used to boil water to prepare chai in a smoke-filled kitchen. India. 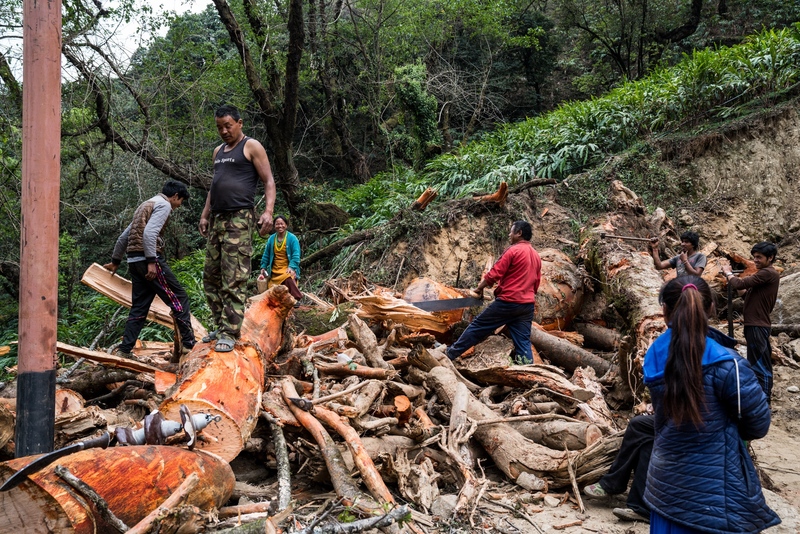 Men and women cutting down sub-tropical forests on the Himalayan foothills of Nepal, which will then be distributed and used as cooking fuel. 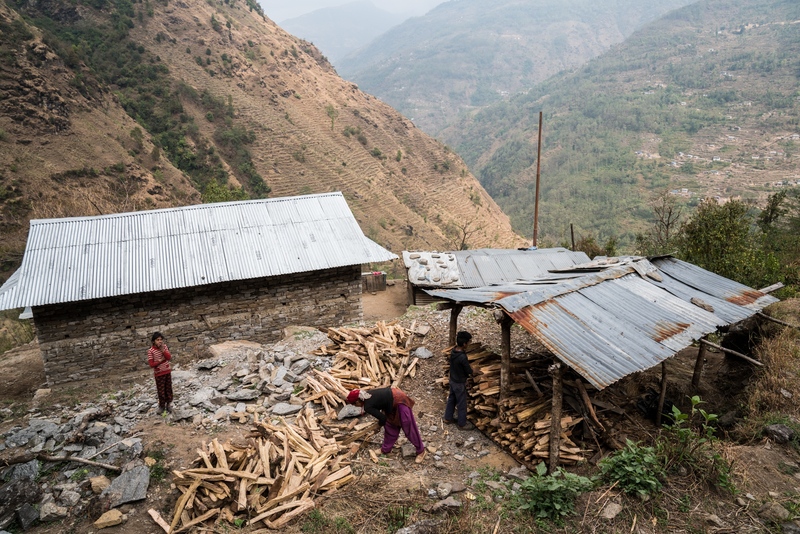 A family cut and store firewood, for cooking, which has been sourced from already deforested parts of the Nepali Himalaya. 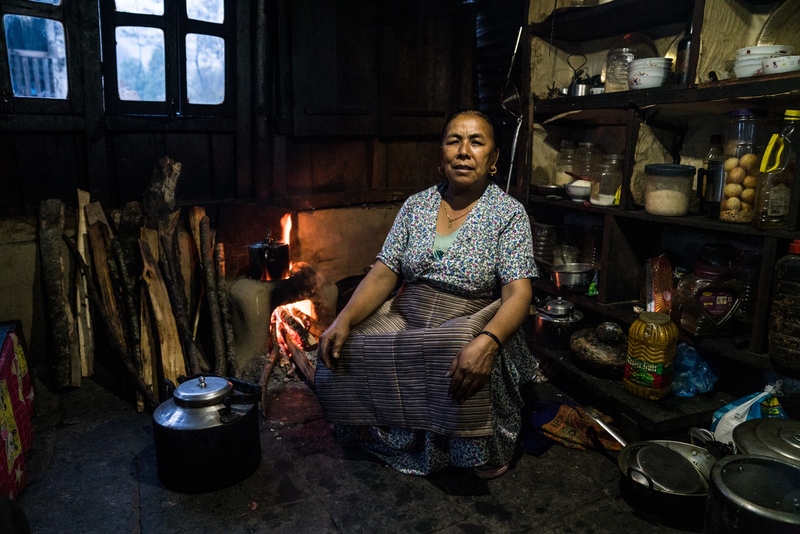 An elderly Nepali woman preparing dinner with her wood-fired cooking stove. Nepal. 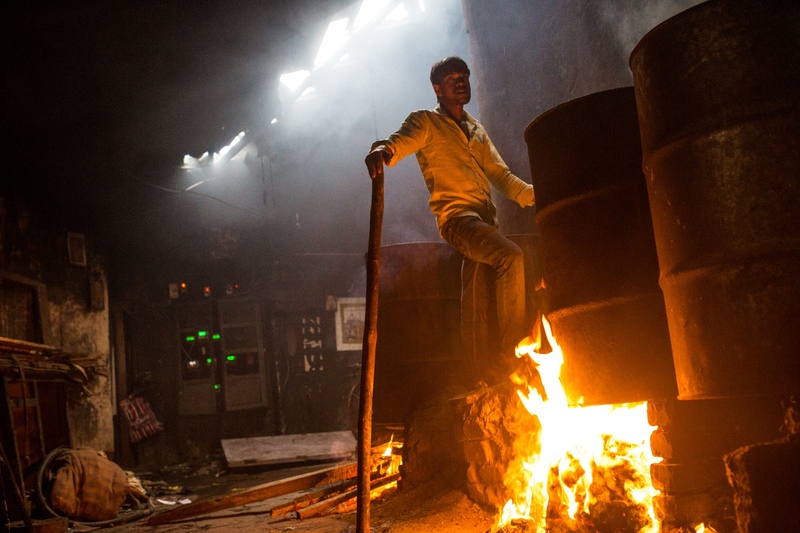 Overlooking barrels of boiling water, all fuelled by wood, a man tends to bed sheets inside that are in the process of being sterilized. Mumbai, India. 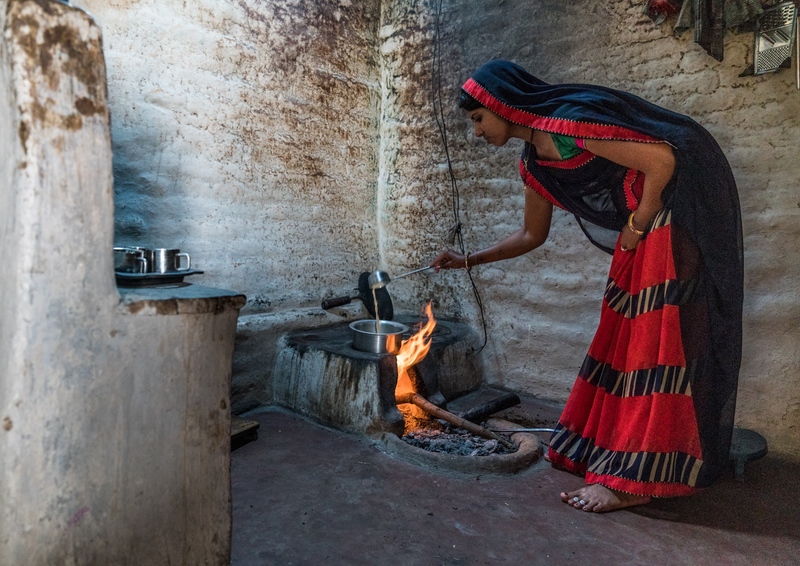 Soot stains the walls of a rural kitchen where a woman prepares chai fuelling the fire with a mixture of wood and dung. Central India. 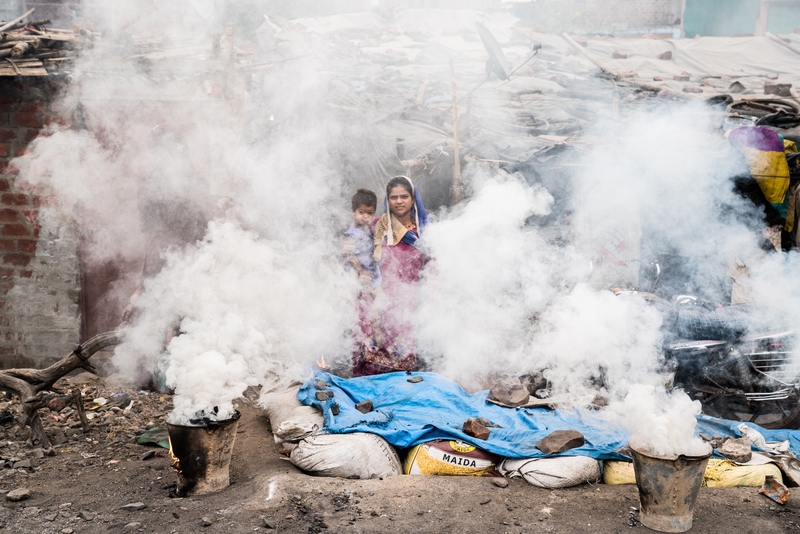 Surrounded by smoke, this is a daily occurrence during meal preparation time for this mother and her newborn, both subject to breathing in deadly particulates such as black carbon. India. 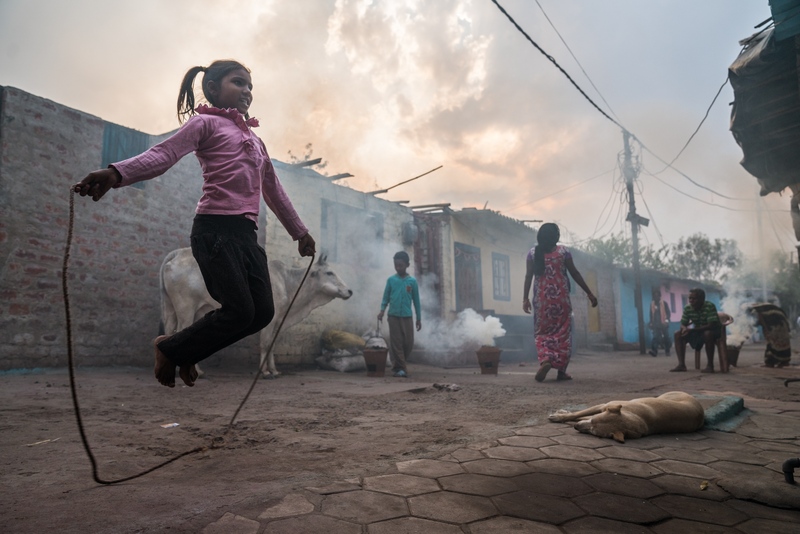 Skipping inside a slum settlement while smokey chullas burn coal, dung, and wood before they are used for cooking dinner. India. Smoke from hundreds of cooking fires blanket an urban area in Central India creating a brown haze during dawn. 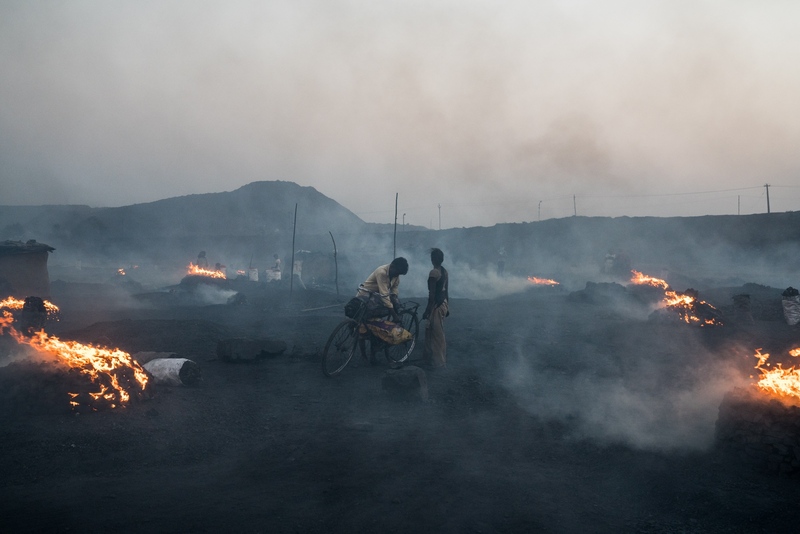 Smoke billowing up from the underground coal-fuelled fires in one of India's largest coal mining regions. Himalayan valley's filled with smoke from both low-land fires and fires from local Himalayan communities. India. Soots heating impact on the glaciers found at the highest points on earth and the rivers that provide water for over 1.4 billion people across Asia. A glacier located high in the Indian Himalayas in rapid retreat from what was once a mighty river of ice that carved it's way all the way down the mountainside. The mighty, but retreating Drang Drung glacier in India's Zanskar Himalaya range. According to locals, the glacier was hundreds of metres longer and thicker no more than 20-years ago. 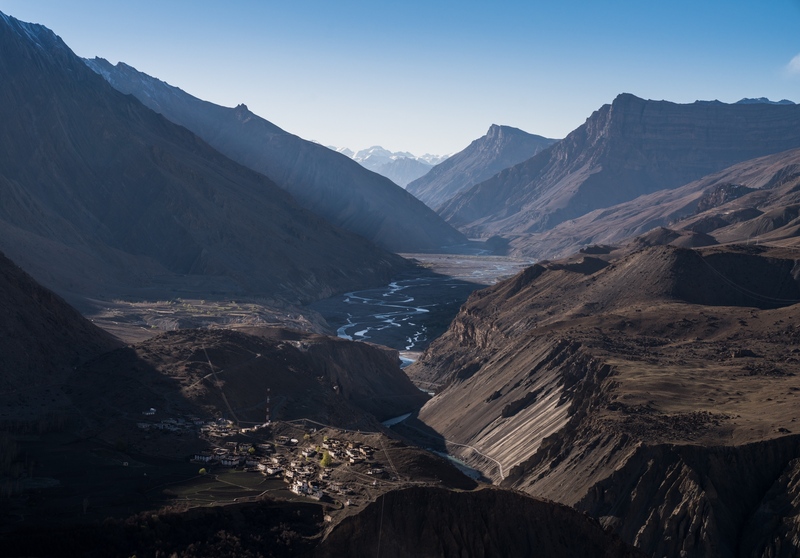 Originating from high Himalayan glaciers, the confluence of two rivers in India's Lahaul Valley. 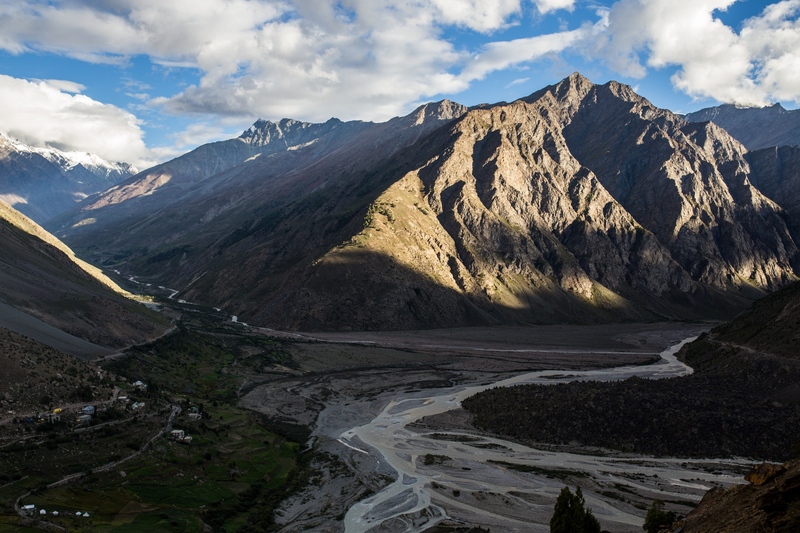 Billions of people across Asia depend on rivers like these for their main source of water. The snaking Spiti River carves its way through on the valley floor originating from the high and remote Himalayan mountain glaciers. This water, connecting with other rivers will eventually reach the flat plains of India. 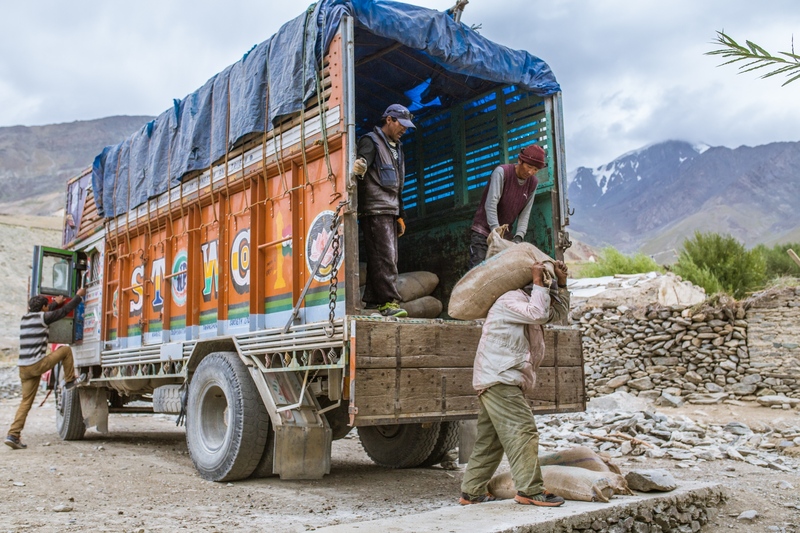 The beginnings of a greater crisis of water shortages across the Himalaya and plains of India with the potential to lead into food insecurity across South Asia and beyond. 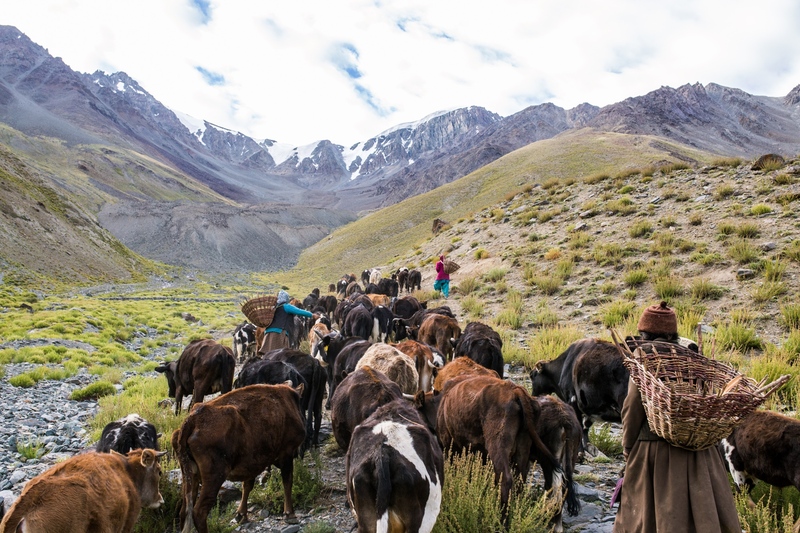 Taking the cows up to the high grazing grounds; the women of Kumik stand below what was once the glacier that provided the village with water. The glacier has completely retreated due to black carbon's and climate change's warming impacts. Livestock return to the village of Kumik, India, where in the recent past, all livestock had to be sold due to water shortages. New homes being built below what was once a mighty glacier that provided Kumik water. Now, the village struggles to quench its thirst. India. 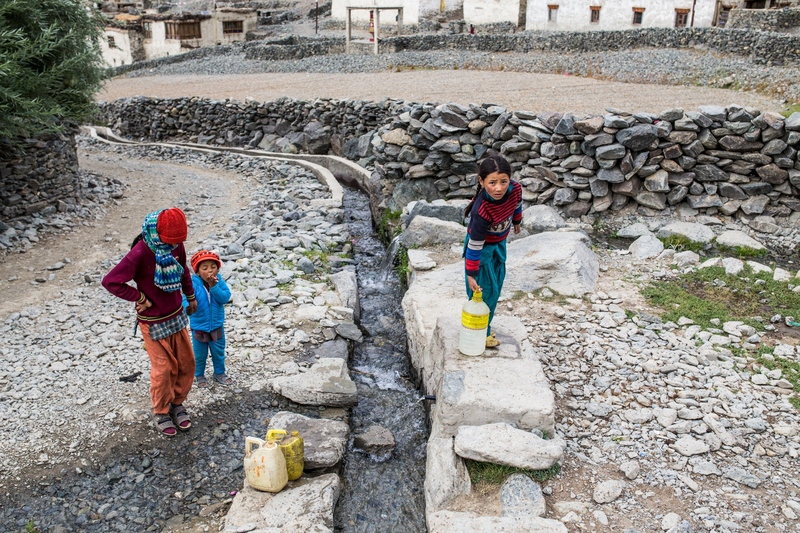 Girls in the Zanskar Himalaya, India, collect water sourced from a spring recharged from winter snow-melt, which is in vast decline due to rising temperatures and black carbon. An empty dam during the summer-season when water is desperately needed to water crops. 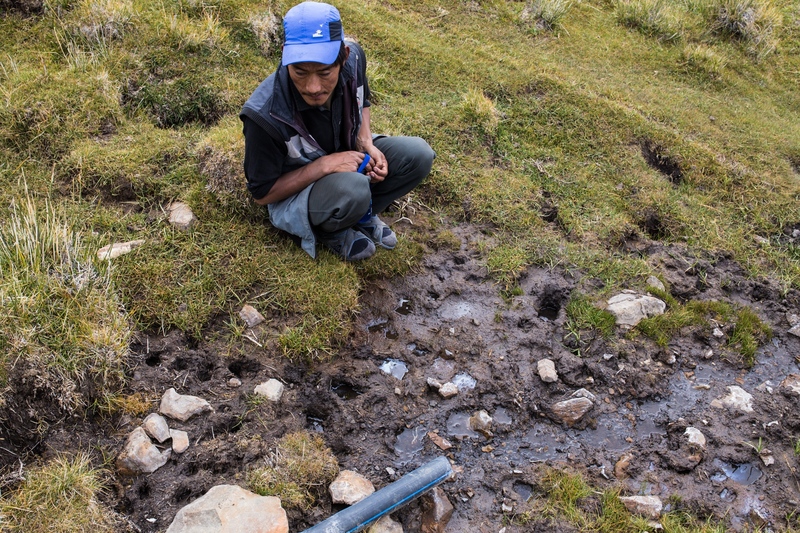 Without Kumik's main glacier, which has now disappeared, water from a single spring is scarce. India. A girl carries water back to her home in jerry cans. Kumik, India. 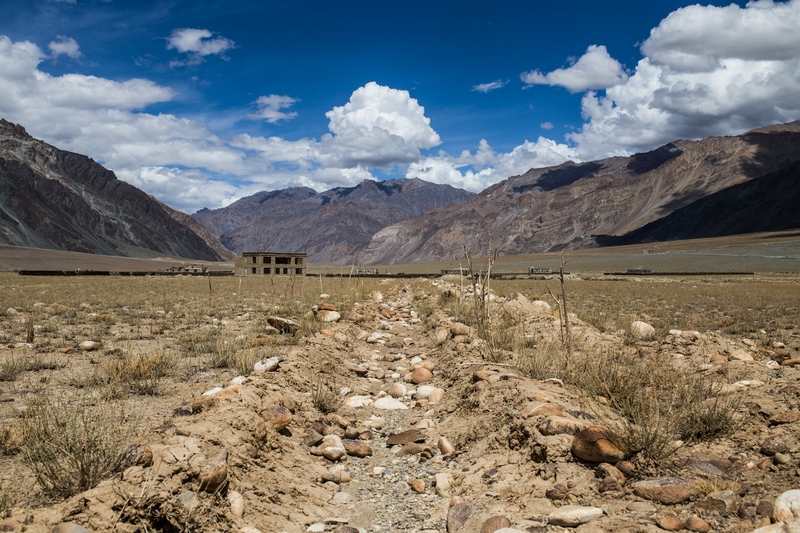 What was once a canal used for irrigation remains bone dry in the Indian Himalaya. 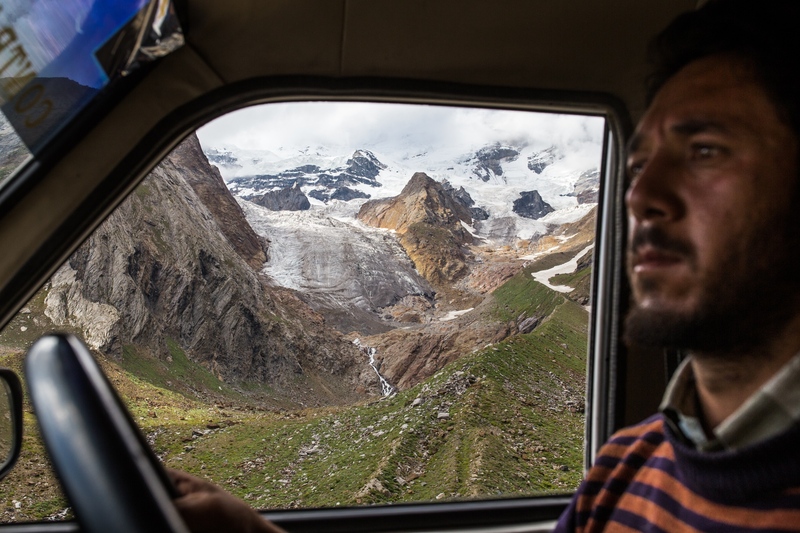 On the other side of the Indian Himalaya Kunga Jorden, of the Spiti Valley, looks at a quicky dying spring. Due to a lack of winter snow-melt because of rising temperatures from black carbon and climate change the spring are unable to recharge. An empty dam behind the village of Kibber, India. The dam is unable to fill up due to a lack of snowfall in winter that recharges the highland springs. Black carbon and climate change are heating up the region and changing weather patterns. 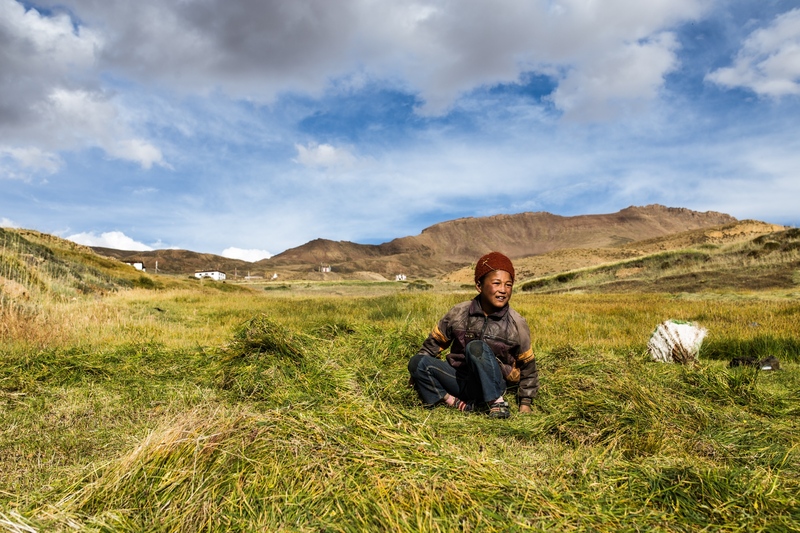 A boy sits on freshly harvested grass, which is food for livestock during the winter months in the village of Kibber, India. 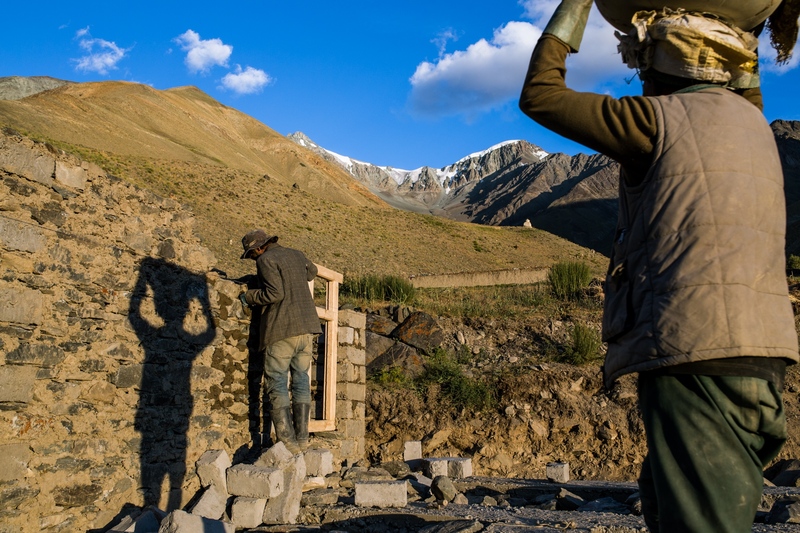 Due to the ongoing trend of declining snowfall, due to black carbon and climate change, the village is becoming water stressed, as the springs are not recharging with new water supplies. 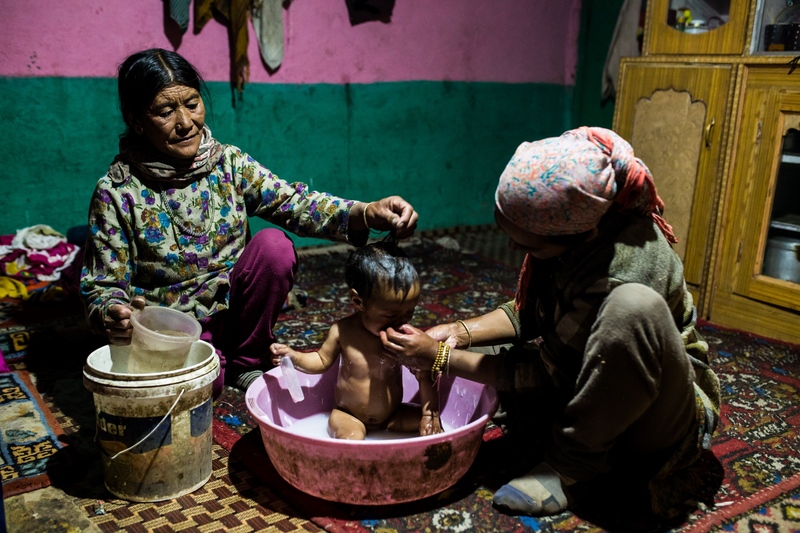 A newly born baby being bathed by grandmother and mother in the water-stressed Himalayan village of Kibber, India. 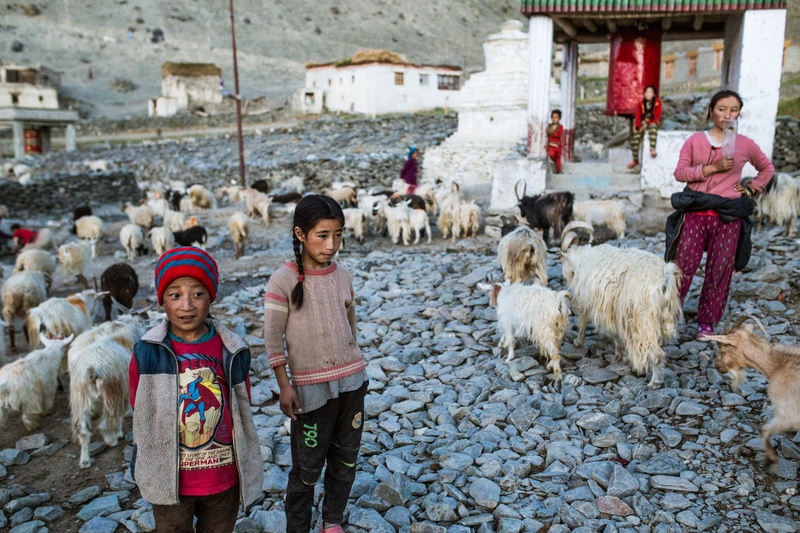 Tazen Chezen and her children stand in front of their new home in the Zanskar Valley, India. 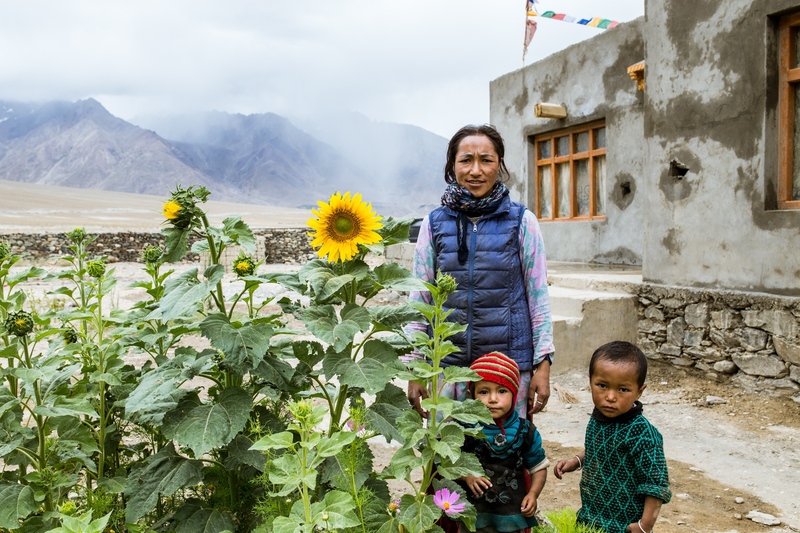 Tazen's family moved in search of water, as their previous home in Kumik faces constant drought due to the old glacier disappearing from warming temperatures. 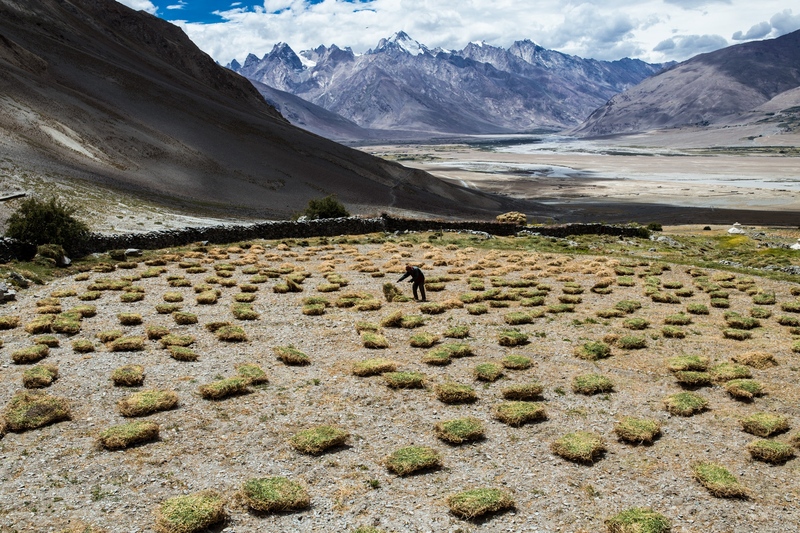 A man tends to patches of sun-drying fodder, used as animal feed during the winter months in the Zanskar Himalaya. A lack of water due to glacial retreats and declining snowfall has drastically reduced the amount that can be produced. 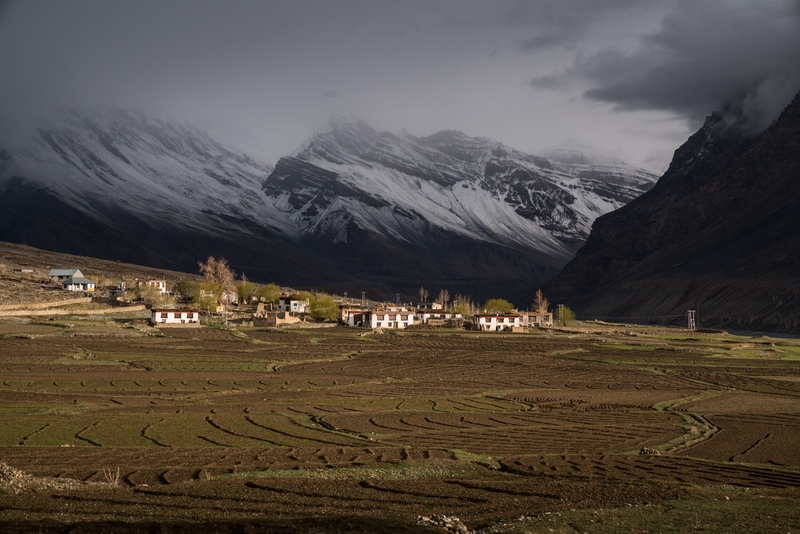 Newly planted crops in front of a Himalayan village, India during a freak snow-storm during Summer. As black carbon and climate changes impacts intensify random weather events, as such, are becoming more common. In 2018, hardly any snow fell during the winter months, with most of it falling during Spring and Summer. 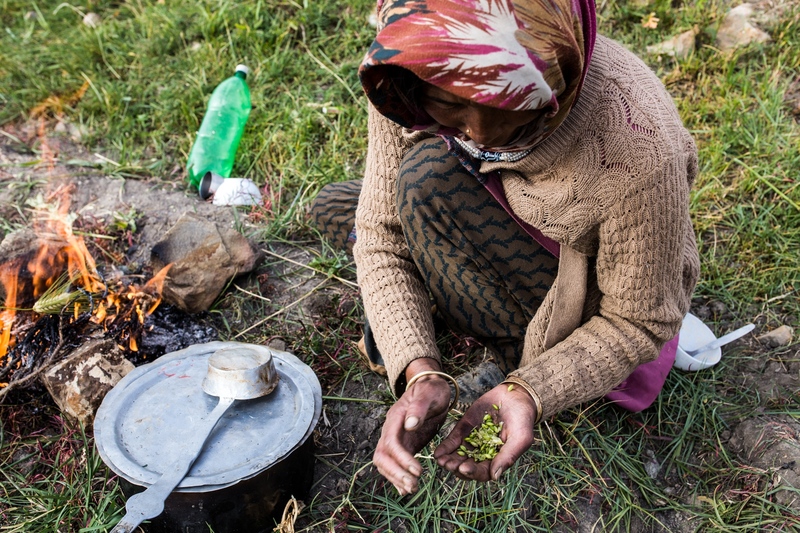 A woman roasts and presents freshly picked barley from her crops in the Indian Himalaya. 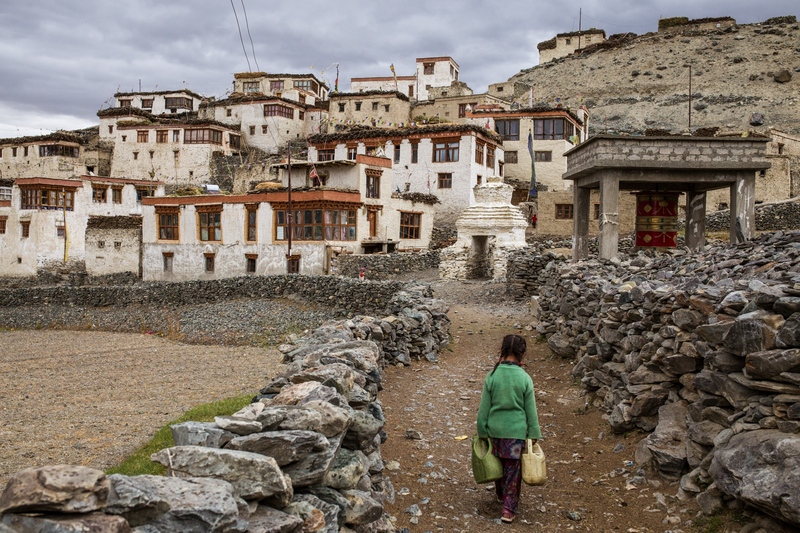 Water shortages due to glacial retreat and declining snowfall are creating the foundations for food insecurity across the mountain regions of Asia. 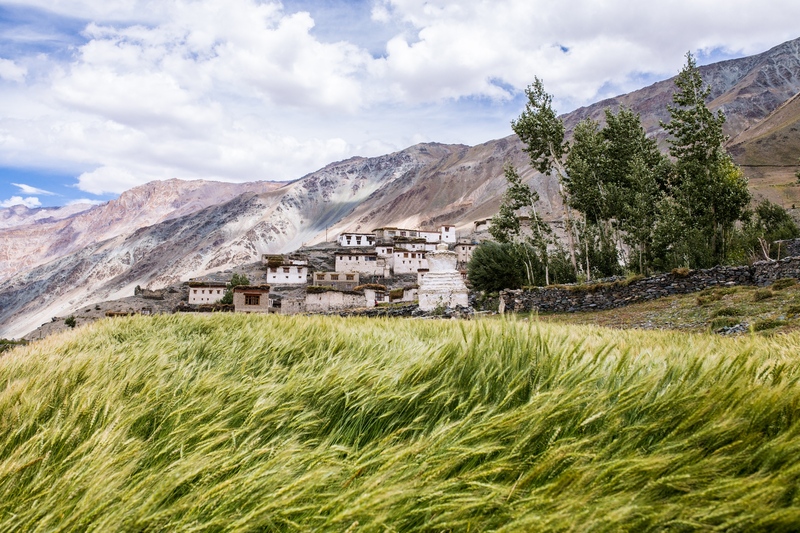 Wheat crops blow in the wind in the village of Kumik, India. Kumik has lost their glacier, once their main source of water, due to black carbon and climate changes warming impacts. Crop yields have significantly decreased with the reduction in water. 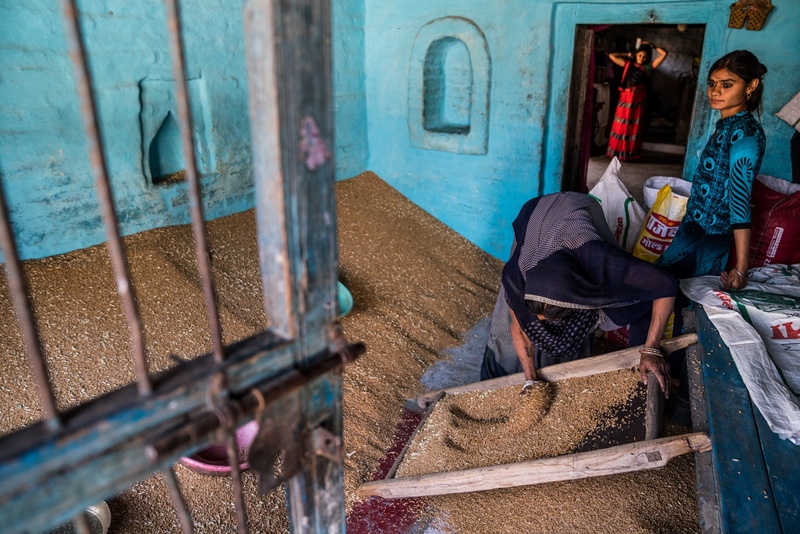 A daughter watches on as her mother sifts through freshly harvested wheat in their home in rural Central India. Black carbon's effect is being felt even on the flat plains of India where it has been negatively contributing to the decline in monsoon rains. A man carries imported food to a storehouse in the water-stressed village of Kumik, India. 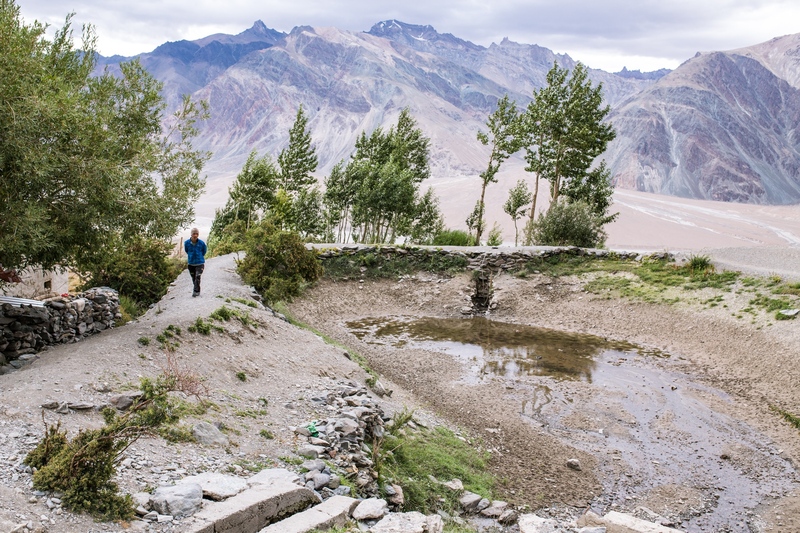 As Kumik's glacier has fully retreated due to black carbon and climate change's warming impacts, the village is unable to produce enough crops because of water shortages. More food is now imported in diesel-powered trucks. 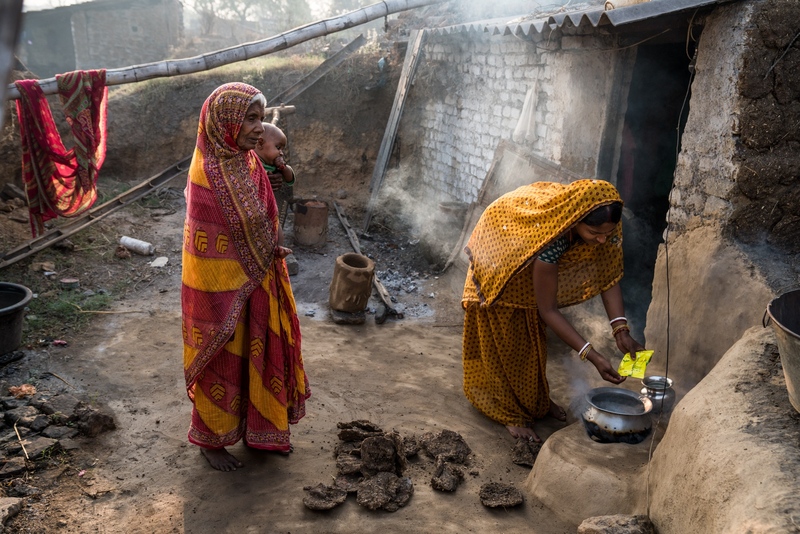 Grandmother and her grandson look on as the mother prepares a boiled breakfast using dung cakes in Jharkhand, India. 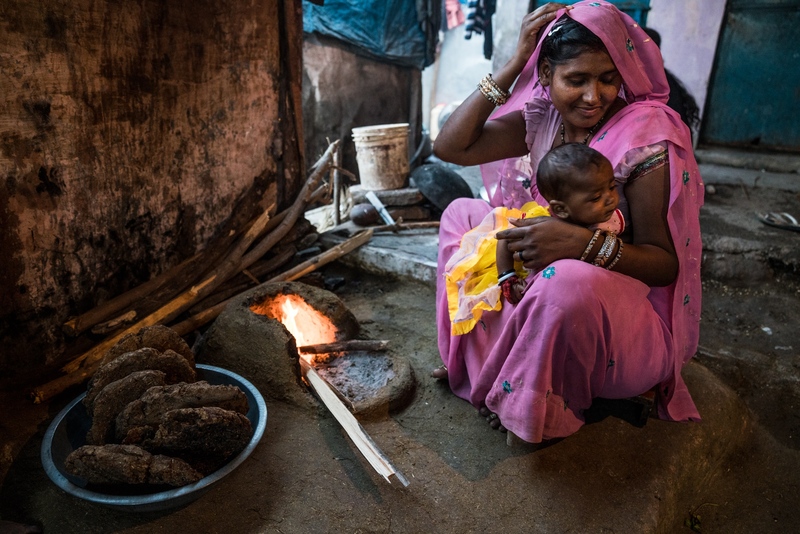 A woman prepares dinner from a dung-fulled fire in Central India. 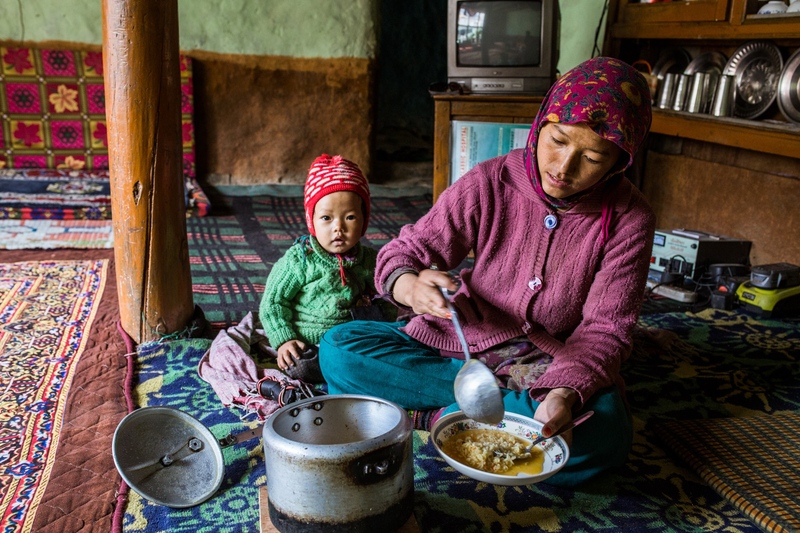 A mother serves a meal of imported instant noodles inside her home in the Zanskar Himalaya, India. Fires and What We're Burning Black carbon and its sources from coal-mines to household cooking fires burning coal, wood and dung. Fire and smoke are everywhere. 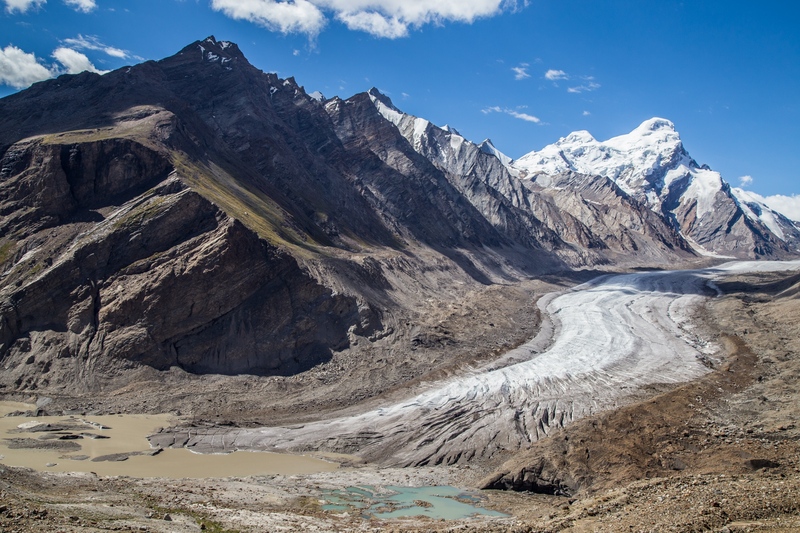 Vanishing Ice and Connected Rivers Soots heating impact on the glaciers found at the highest points on earth and the rivers that provide water for over 1.4 billion people across Asia. 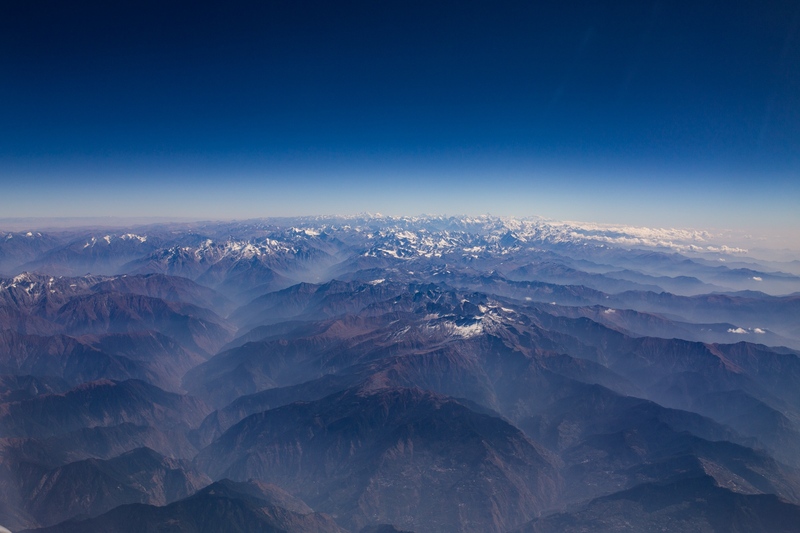 Water and Food The beginnings of a greater crisis of water shortages across the Himalaya and plains of India with the potential to lead into food insecurity across South Asia and beyond. Ashley Crowther is an Australian documentary photographer focusing on environmental, social, and climate-related issues throughout Asia.